Dug up by Duncan Brooker in the late 90’s, and later to be compiled on the first wave of Africa rare groove-comps; AFRO-ROCK on Koda an Strut. 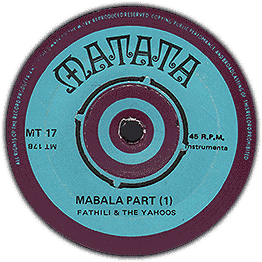 ‘MABALA’ is a Kenya instrumental funk classic! Layered with spacey Moog effects, a bluesy guitar lick, stripped sax and cool spoken female vocals it showcases the Yahoos in great form. A band who have several noteworthy releases on different labels, note the Taarab collaborations with vocalist Hafusa Abasi. Their largest output however was on the Matata and KWE labels. Judging from the musical output of these labels I’ve come to believe the band was performing in tourist circles, if anyone have any more history of the Yahoos band please let us know.